Warm and mostly sunny conditions will continue through Wednesday, November 16th. Our next storm will then arrive on Thursday, November 17th. Dry weather for the weekend of November 19th and 20th, followed by another storm during the week of Thanksgiving. Much of the same through the middle of next week. Temperatures will continue to stay on the mild side under partly to mostly sunny skies. Areas to our north will see a quick chance for a few flakes Sunday morning through Sunday night but I think we'll stay dry along the I-70 corridor. It will then be back to very mild temperatures and sunny skies through the middle of next week. Our full attention is now on next Thursday, November 17th as we'll finally see a decent storm move into Colorado. This system doesn't look overly impressive (yet) but that can always change over the next few days. At this point we are looking at about 3-6 inches for the I-70 mountain corridor. 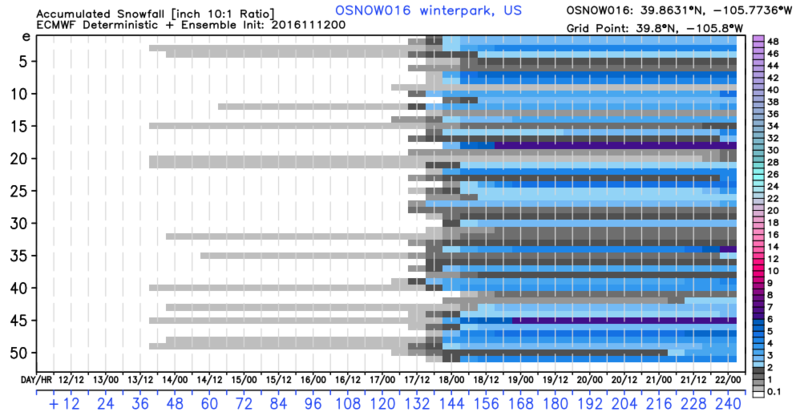 Below is the snow forecast for Winter Park over the next 10 days, with the dates running along the bottom. This graphic provides 51 versions of the European ensemble model so it provides a nice perspective of the upcoming storm. The other piece of exciting news that I can provide about this system is that it will be accompanied by much colder, winter-like temperatures. 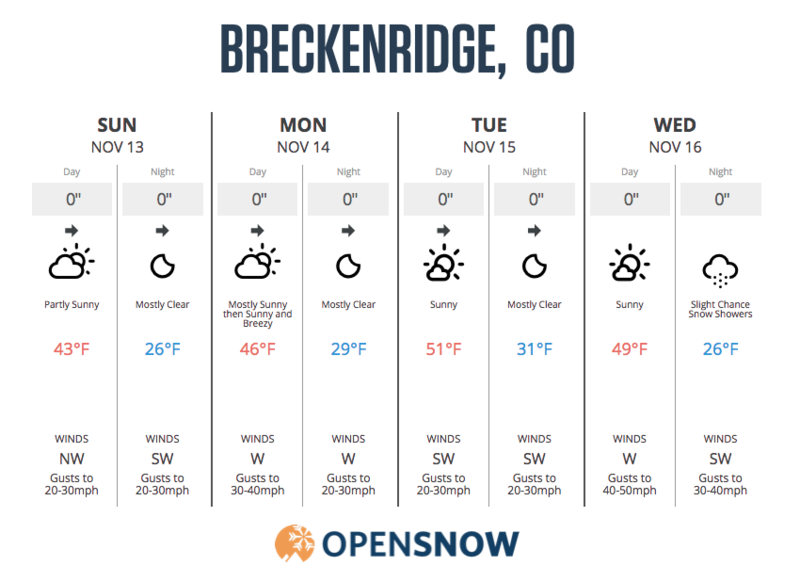 This will be great for snowmaking along the corridor as we head into the following weekend. In summary, we will likely see light to moderate snow totals, chilly temperatures, and winter driving conditions for Thursday and Friday of next week. Looking further ahead, we will see dry conditions return through the weekend of November 19th and 20th, followed by our next chance for snow during the week of Thanksgiving. Thanks for reading and have a great rest of your weekend!